September 10, 2016 in Personal Stories. When asked such a question, few of us might raise our hands, possibly through a combination of humility and the absence of having more than two arms? Ringu Tulku Rinpoche asked the question when he returned to Palpung Changchub Dargyeling in June 2016, fittingly as Wales was swept by Himalayan-style torrential monsoon rains. On arrival he was greeted by Chamtrul Rinpoche and Lama Rabsang; and the rainclouds above Brynmawr parted, exposing the clear expanse of a summer sky. It stopped raining for a bit -in Welsh terms -a miracle of sorts. This year’s weekend teachings were on the topic of Bringing Relative and Absolute Bodhicitta into our everyday lives. Rather than solely the remote preserve of only fully realised beings, Rinpoche presented Bodhicitta in accessible terms – that anyone can manifest, if they so choose. 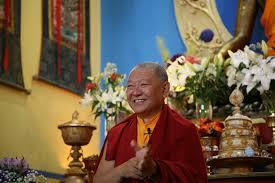 Rinpoche taught that it starts with the aspiration to help free another being from pain and suffering. That wish is a seed that slowly germinates over time, whenever it is planted in fertile ground. Essentially, compassion for another starts with wishing compassion for ourselves. Our own wish to be free from suffering and its causes. Just as we wish this for ourselves, so all other beings wish this for themselves too. So, if we have suffered pain in the past, we understand how it feels, and don’t want it to also happen to others too. We also learn that if everyone else is happy, that will be interdependently good for us too. However we don’t always feel able to do anything really useful, lacking belief in our ability to help. But, when we realize that anything we do, which helps us to increase our positive side and which lessens our negative side, will increase our power to help – then we can build belief. While we can have high and noble aspirations and intentions, we start with practical, down to earth actions. As we develop more patience, discipline and generosity- we grow our compassion. When we start to deal with our own issues, then maybe we can go on to help one, two, or perhaps more beings. The process isn’t instantaneous but it is possible. If we look at what’s happening inside us, and look at our agenda, we become aware of what’s actually going on. We see how we react, moment by moment. We notice what is affecting us and other people. Each moment leading onto the next. Because of our mind’s strong habitual tendencies, lots come up, but over time we can develop the wisdom not to be led by anger, hatred, resentment or ill-will. If we take one day as one life, at the end of every day we can rejoice in, appreciate and dedicate what went well, and purify and let go of what went badly. In this way we can transform a life made up of days. There is no pressure, no compulsion. We simply do how much we want to do and are ready to do. We simply just do it, if it is good for us and good for others. We learn to avoid doing things we’ll regret at the end of the day. We can even take this up as a hobby; people never get burnt out by their hobbies. The “weight” of anything depends on ourselves. To be compassionate is not only useful for us and others; it’s actually the only solution for our own transformation and that of society. When we see suffering clearly, we realize that no new system, rules, or laws will sort it all out. We have to change ourselves, and do so voluntarily, to become compassionate and kind to each other. This transformation will only happen if we value this as important. If I’m angry or upset or hateful, it helps no one, least of all me. We understand that we are still samsaric beings, not the finished product yet. Yes, we have selfishness. Bad moods. Ups + downs. We may not have perfected the 6 Paramitas yet. But, if someone helps me, I feel good. So why not help others, in return, too? We may not have perfect wisdom, but we can do our best, with best intentions. If we do that, we can’t go too far wrong, and are unlikely to do something too harmful. If our motivation is to help, then we shouldn’t have any regrets. We can never be sure of alternative outcomes, but the more compassionate we are, the more good things tend to happen. Whereas the more selfish and self-centred we are, the more misery and suffering will result. The more we obsess about ourselves, the more we will suffer. Happiness is experienced from our mind having peace and joy. We practically achieve this by feeling love without attachment. We feel happy when someone we care about is happy. If we are a parent, and we love our children, we also wish we can take on any suffering they experience. If we can extend this kind of loving kindness compassion, we experience more joy. There is no Tibetan word for “stranger”-as it is believed that nobody is a stranger -as everyone has previously been your mother. We just don’t recognise them now! As we extend our loving kindness compassion to others – we don’t lose it – we just accumulate more happiness! To become a fundamentally happier person, we first become more compassionate and kind. The less our mind is grasping, the happier it will be. Ironically, exclusively wishing well for ourselves, is the source of all our problems, agitation, discontent and suffering! Self-centred clinging and grasping to a “Me” is an obstacle. Ultimate Bodhicitta is egoless and without self-centredness. Bodhicitta isn’t necessarily a “Buddhist” attitude; it’s merely a genuine commitment to the wellbeing of other beings, through removing their suffering. The mark of any great saint or truly realized being, is the absence of this self-centredness; a sign of ultimate Bodhicitta. This only manifests when we truly understand the way we are and the way everything is. The route to this pure and perfect compassion is through understanding, reflection, investigation and meditation. That way we see how things exist. We see their nature. That everything is changing, that there is nothing that doesn’t change. That nothing exists independently. Everything is interdependent, influenced by causes and conditions. Nothing exists on its own. All is flow, always changing. All my body’s cells change completely every few years. So “Me” is just a concept- there is nothing about “Me” that is permanent. My consciousness is just momentary thoughts and emotions. We assume that there is something called “Me” but where is it? Our ego is based on the assumption that there is something called “Me”, that is truly existing somewhere in our body. But when we look, we see that’s a wrong and mistaken assumption. One to which we are strongly addicted. We have been constantly trying to confirm and affirm a “Me” since beginningless time. This is the basis of all our problems, all samsara. Aversion, attachment, fear and worry all come from this. We grasp at holding onto secure concepts. We are fixated on our constructed identity of “Me”. We identify with past memories and traumas; our karma is basically our habits. But, the more compassion we have, the less self-centred we become, and the less clinging we will have to this fabricated “Me”. This way we positively transform our habits, and therefore our karma. Such wisdom is experiential. Lessening self-centredness is the strongest method of purification. Our flaws are not new, they have been with us for lifetimes. But if we’re able to change a little bit, for the better, we should appreciate it. We take small steps. If we meditate on our impermanence, on the reality that we could die today, then we are more likely to work on integrating these teachings in our lives. If we appreciate this precious opportunity, we focus our minds and use the teachings on ourselves. Whether deep or high, these teachings only work if they’re applied. Enlightenment is about fully understanding and experiencing what we are. When we see that there is no need for attachment or aversion at all, then the capacity of our mind can be fully used. Mind is nothing but awareness. There is nothing to get. And nothing to get rid of. Some people are more naturally compassionate and show signs of Bodhicitta easily, as they awaken habitual tendencies from previous lifetimes. Whereas in others, Bodhicitta is less visible, hidden, even suppressed, due to alternative habitual tendencies being more strong. Sometimes we have high expectations of Dharma practitioners. Some unrealistically expect Buddhists to be perfect. When you go to a hospital, do you expect everyone to be well? Well, people go to Buddhist Centres to become compassionate, not because they’re compassionate already! The Sangha is not merely a community, but rather beings who have taken the same vows, traveling on a similar path, with similar aspirations, undertaking similar trainings. In life we learn together best through appreciation, not through punishing or criticizing each other. A Bodhisattva needn’t be a perfect Bodhisattva. School starts with nursery! There is nothing wrong with feeling “I’m a Bodhisattva”. The Bodhisattva Vow is a commitment to train myself over a long time, so that eventually I’ll be able to help everyone.